Taco Bell has taken the very first Taco Bell restaurant from Downey, CA and moved it to their headquarters 45 miles away in Irvine, CA. Much like you'd move a prefabricated or existing house, the building was lifted off its foundation and placed onto a truck bed for transportation. The move came about as the restaurant was slated to be demolished due to plans for new development on the land. Technically, the restaurant hasn't served as a Taco Bell since they vacated it back in 1986 as it was a small 400 square foot space that lacked indoor seating and a drive-thru. It operated as several taquerias throughout the years but was permanently vacated in December of last year. 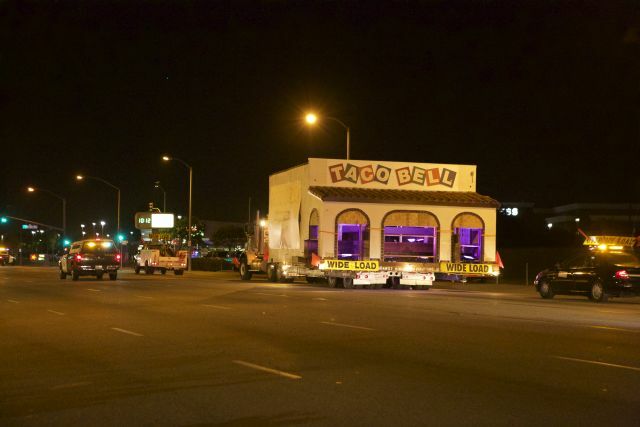 Taco Bell plans to keep the building at their headquarters for storage until its future use is determined. They seek to make that determination in the near future with input from their fans.